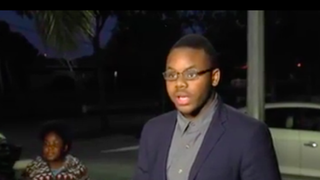 Eighteen-year-old Malachi Love-Robinson was arrested on charges he illegally operated a medical office in West Palm Beach, Fla., but he's refuting the allegations. Love-Robinson was charged with practicing medicine without a license, as well as theft. The theft charge was added after an elderly patient came forward and said that Love-Robinson stole three checks cashed for almost $2,800, and also charged her $3,500 for treatment. The alleged Pookie Howser was released from jail after posting his $21,000 bail. Love-Robinson held a press conference Thursday night and said that the allegations against him were false. As he stood outside, he thanked his supporters and mentioned the haters. "I am deeply saddened and a little disrespected by some of the things that have come forth," he said. "My attorneys are working hard; they're working around the clock to make sure this issue gets resolved in the best way possible." By 'attorney,' you have to wonder if he means the little kid standing next to him? Sure, some may find his antics funny and even enterprising, but it's clear that Love-Robinson has some issues to deal with.